You'll find plenty of places to visit near Mildura: Perry Sandhills (in Wentworth) and Mungo National Park (in Balranald). The adventure continues: brush up on your knowledge of spirits at Fossey's Ginporium and Distillery, explore the activities along Murray River, don't miss a visit to Lock 11, and explore the world behind art at Mildura Arts Centre & Rio Vista Homestead. For reviews, traveler tips, and other tourist information, read Mildura road trip planner . Goulburn to Mildura is an approximately 8.5-hour car ride. You can also fly. In April in Mildura, expect temperatures between 28°C during the day and 12°C at night. You'll set off for Tanunda on the 19th (Fri). Explore Tanunda's surroundings by going to National Motor Museum (in Birdwood), Gorge Wildlife Park (in Cudlee Creek) and Monarto Zoo (in Monarto). There's still lots to do: learn about winemaking at Seppeltsfield, awaken your taste buds at some of the top wineries in the area, make a trip to Whispering Wall, and stroll through Riesling Trail. To see reviews, ratings, traveler tips, and more tourist information, read our Tanunda trip maker tool . You can drive from Mildura to Tanunda in 3.5 hours. Another option is to take a bus. In April, plan for daily highs up to 26°C, and evening lows to 13°C. Wrap up your sightseeing on the 26th (Fri) to allow time to travel to Port Augusta. Change things up with these side-trips from Port Augusta: John Pirie Bridge (Bridge to Nowhere) (in Port Pirie), Whyalla (Hummock Hill Lookout & Whyalla Maritime Museum) and Steamtown Heritage Rail Centre (in Peterborough). Spend the 30th (Tue) exploring nature at Mount Remarkable National Park. There's still lots to do: take in nature's colorful creations at Australian Arid Lands Botanic Garden, take an in-depth tour of Homestead Gardens, browse the exhibits of Jeff Morgan Gallery, and view the masterpieces at Port Augusta Cultural Centre - Yarta Purtli. Plan trip to Port Augusta with our itinerary maker to find out where to go and what to do. You can drive from Tanunda to Port Augusta in 3.5 hours. April in Port Augusta sees daily highs of 27°C and lows of 15°C at night. Cap off your sightseeing on the 1st (Wed) early enough to travel to Coober Pedy. Coober Pedy is known for museums, historic sites, nature, wildlife, and shopping. Your plan includes some of its best attractions: admire the landmark architecture of Faye's Underground Home, pause for some serene contemplation at St Peter & Pauls underground Catholic Church, examine the collection at Old Timers Mine, and stop by Seven Stones Designer Jewellers. To see traveler tips, more things to do, photos, and tourist information, go to the Coober Pedy itinerary website . The Route module can help you plan travel from Port Augusta to Coober Pedy. In May, daily temperatures in Coober Pedy can reach 26°C, while at night they dip to 13°C. Wrap up your sightseeing on the 5th (Sun) early enough to drive to Uluru-Kata Tjuta National Park. Uluru-Kata Tjuta National Park is known for nature, museums, outdoors, trails, and classes. Your plan includes some of its best attractions: take in the dramatic natural features at Uluru, get outside with Walpa Gorge, trek along Kuniya Walk, and tour the pleasant surroundings at Uluru Hiking Path. To see ratings, more things to do, where to stay, and tourist information, you can read our Uluru-Kata Tjuta National Park online trip itinerary builder . Traveling by car from Coober Pedy to Uluru-Kata Tjuta National Park takes 8 hours. Alternatively, you can fly. In May, plan for daily highs up to 28°C, and evening lows to 12°C. On the 11th (Sat), you're off toAlice Springs. Spend the 16th (Thu) exploring nature at Finke Gorge National Park. The adventure continues: look for all kinds of wild species at Wildlife Areas, steep yourself in history at Alice Springs Telegraph Station Historical Reserve, take some stellar pictures from Anzac Hill, and take in the awesome beauty at Mount Gillen. To find other places to visit, more things to do, and other tourist information, go to the Alice Springs driving holiday site . Traveling by combination of flight and taxi from Uluru-Kata Tjuta National Park to Alice Springs takes 2 hours. Alternatively, you can drive. In May in Alice Springs, expect temperatures between 28°C during the day and 9°C at night. On the 17th (Fri), you'll have the morning to explore before heading off to Katherine. Katherine is a town in Northern Territory, Australia. Change things up with a short trip to Bitter Springs in Mataranka (about 1h 55 min away). Spend the 19th (Sun) exploring nature at Nitmiluk National Park. And it doesn't end there: explore the striking landscape at Katherine Gorge, tour the pleasant surroundings at Cutta Cutta Caves Nature Park, explore and take pictures at Katherine Outback Experience, and explore the galleries of MiMi Aboriginal Art & Craft. For ratings, reviews, more things to do, and more tourist information, go to the Katherine route planner. Fly from Alice Springs to Katherine in 4.5 hours. Alternatively, you can drive; or take a bus. Traveling from Alice Springs in May, expect Katherine to be somewhat warmer, temps between 38°C and 20°C. Cap off your sightseeing on the 24th (Fri) early enough to go by car to Darwin. Take a break from Darwin with a short trip to Litchfield National Park in Batchelor, about 1h 45 min away. Spend the 24th (Fri) wandering through the wild on a nature and wildlife tour. Spend the 31st (Fri) on the water with a fishing tour. 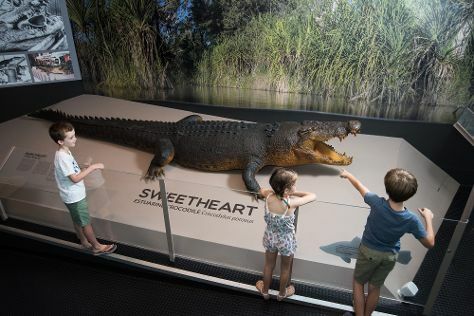 There's lots more to do: examine the collection at Museum & Art Gallery of the Northern Territory, get interesting insight from Tours, cool off at Darwin Waterfront, and look for all kinds of wild species at Crocosaurus Cove. For where to stay, ratings, more things to do, and other tourist information, use the Darwin trip website . Drive from Katherine to Darwin in 3.5 hours. Alternatively, you can take a bus; or fly. Traveling from Katherine in May, Darwin is somewhat warmer at night with lows of 26°C. Wrap up your sightseeing by early afternoon on the 2nd (Sun) to allow time for travel back home.